Some time ago I did a post about putting the shop window software on a domain for affiliate sales, I pretty much have forgotten about the site but was asked for an update on the script and how it was doing. Improvements made, after installing the software I had someone make the url’s more seo friendly and created my own categories using the search function along with some unique text/description at the top for some of the categories. I also bought a template from templatemonster I think for a basic design to make the front of the site look better and less like an aff site. So around 890 clicks through to a merchant from the site generating 19 sales of just over £1400. Not exactly massive or overly impressive but again it’s a zero maintenance site, I don’t think it’s worth pumping out sites like this though, not real value so could disappear overnight unless you really worked on it to build new content & information in the way of reviews or ran alongside a blog. Hi Scott, thanks for sharing. I don’t know how much time you spent setting this up but surly it would be worth making more sites like this. It could add up to quite a sum. Passive income is the way ahead…. Still, 5% commission on those sales isn’t bad for zero maintenance. 1. What was the status of the domain when you bought it? 2. How much promotion have you done on the site to build to that traffic level? How do you run/maintain 100+ stores? What software do you use to set them up? The soft was coded by myself, check seeyouguys dot com. Fed by amazon, I need like 10 minutes to set up a new store (plus the keyword research). Nothing perfect but they earn some money. Vilo, I’m guessing that the hard part is not setting up the sites but rather the time needed to keep promoting all of them? Exactly the question I was going to ask, the site is PR5 (very nice!) and I wonder what sort of promotion/linking was used. I reckon that for the right keywords that site has potential for much more than 100-250 visitors per day. I used an old dropped domain that had backlinks and 301’d it to a new better one (lumens) and added 2 links and that was it. The site ranks for the categories I made through he search function so ranks for things like floor lamps, ceiling lights, bathroom lighting, table lamps, bathroom lights, light shades, wall lights, led bulbs, micromark, floor lamp. I have tried the same, i.e. to use an old dropped domain and 301 it to a new domain that I want to rank better. Problem is I haven’t seen any changes in my rankings and now it’s been 3 months. How did you 301 it? That’s exactly what I have used (the PHP version). But if it really works, it makes great rankings much easier. Just go to Godaddy auctions and buy a few domains with some decent links, 301 redirect the domains and lean back and watch your rankings improve. Thats still over $100 per month. You could probably make a decent amount selling it or would you try and lease it? That way someone else will go and develop a load of content for it. Well that may improve your PR but will it help you in the SERPS for anything? The anchor text on those link s is going to have virtually no relevance to your content unless you buy sites in the same category and even then it will be a bit hit and miss. Is it worthwhile doing this other than for a higher PR? Yep I think you need some relevance > continuity. Not bad at all, but as you said, it will lose value quickly unless you regularly update with fresh articles or run alongside a blog. I see you also have adsense on the site do you benefit from having them? Not really worth it to be honest. It amuses me when you say one of your sites *only makes* X, Y or Z. Some of us are still only making that kind of money from all of our sites! So what shopping cart did you use to set-up the shop window? The templatemonster template definetely adds to the appeal of your landing page. A wolf in sheeps clothing, but it pays to bamboozle the viewer. Managing a lot of these will be quite a challenge, but isn’t that something you could farm out? Scott I’ve looked into this but never really fully understood how it works. Do you have to approach the individual companies and strike an affiliate agreement? Personally, if I had one site making this money I’d be spurred on to create a whole raft of them and as you say, bolster them with blogs and reviews. It’s a free service offered by AffiliateWindows – so they run all the advertisers and provide the script which automatically pulls in a feed of products and new products. Scott – is the CommentLuv plugin on SMM working? I’ve not noticed it lately on any of the comments? 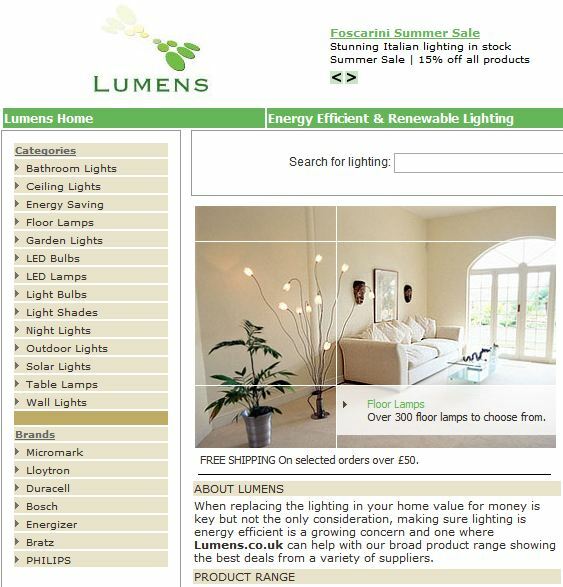 Scott, I think you have a great site with lumens.co.uk It’s got good content, great page rank and it’s well found in within the search engines. I’m really surprised it’s not making more money for you. If the Affiliate Windows is the main source of income would it be worth improving the sites appearance to instate faith into lighting buyers i.e. dropping the adsense and improve branding. Don’t get me wrong I think it’s a reasonable looking site but in my honest opinion if you just had a stronger logo and lost the adsense it would look like a more trustworthy shopping site and therefore may give you more clicks. Julian, why do you think that he need to drop the adsense? I don’t think it necessarily makes sites untrustworthy if done right. I agree that perhaps the branding of the site could be a touch more glossy and slick but that would be it – £1400 a month to me sounds pretty damm tasty. Ok maybe you wouldn’t need to drop all of the adsense adverts, but you need to find a good balance to make a site look more offical and not just like an advetising site. In my opinion adsense in the top header says “Advertising Site” but if you dropped that top adsense banner and used images and a strong brand it would say “Lighting Site”. For example I just spent 2 mins with a screen shot (aboutmotors.co.uk/misc/lumans.jpg) and i honestly think it would have a more positive impact on the site visitor, reduce bounce rate and hopefully get more AffiliateWindows clicks. I like what you did Julian and could see how it could improve the feel. For info in August so far the site has sold £2117.35 of lighting products and earned £96.32 commission. Well that is a nice improvement Scott. July was £1,900 in sales right? If August will hit around £3,000 in sales that is indeed a nice increase. Thanks Scott. I’m glad you like it, if you think it could help then let me know and I’ll email the files over. Good sales figures for August so far, hopefully it will continue to increase! Scott, £96 of profit with £2117 in sales – that´s just 4,5% commission!!! With Amazon (only) you would have 6,5% with that volume (my guess as I don´t know your volumes). The truth is that amazon.co.uk´s inventory is pretty much reduced compared to that of amazon.com. 1.) that unused, expired domain… was it dropped/unused for a long time (like used last in 2006, then dropped and used by a domain parking company)? 2.) was this domain topically related to lighting or totally unrelated (in terms of backlinks, did it have backlinks with “lighting related” anchors)? 3.) has anyone of you tried to 301 redirect more than just one old dropped domain to one site. I mean if I would buy 20 deleted domains, would register them again and then redirect them to just one existing website – does anyone of you have any experience with this? 4.) did you promote the expired domain with some new backlinks again, or just the lumens? any tips or ideas that would help kick-start it? Just started playing with v3 version of the api for shopwindow. I download all the products I’m interested in to mysql so don’t rely on hitting their servers all the time. Its is pretty good for zero maintenance website & definitely a profitable position without any investment of most important asset; time. You are indeed in profit. However, it should be considered against the kinda monetary investment you had made back then & your goals for that project. Do share that with your readers. It would definitely increase number of loyal readers. Just wanted to say thanks for sharing great info such as this. I have found your blog so helpful and educational in a subject area that’s hard to find reliable information! Just wondering how this site is doing now being as your initial posting was a few months ago now. Has the traffic picked up more or dropped? Have your rankings improved or dropped? I’m assuming that you have left it alone rather than added any fresh content? I’ve seen a few sites based on Shopwindow now so I think I might as well set one up and see how it goes. Just need a nice niche and domain name! Checked analytics just now and 6,680 visitors in the last month so seems to be continuing on a pretty steady path. From AffWindow checking the Click ref shows from Lumens there have been 22 sales of around £1500 for October. Sounds solid Scott, even tho it doesnt bring in big money it a nice litte earner. How’s the adsense going on it? So when did this site actually go live? Seems to be a decent amount of traffic you’re getting but it’s a shame it’s not converting better. I know you can’t tell too accurately but as a rough percentage, out of the 6680 visitors, how many clickthroughs are you getting? Around 1600 click in the last month according to Aff Window Stats, sales are up recently so will leave it a month or so after doing some tweaking and revisit this. Yes, I was looking at shopwindow earlier today and I couldn’t find any decent tutorials on it at all. Very annoying. That sounds like a pretty decent return on your investment, and nice to see it’s increasing. With regards your comment about the site having “no real value”, could you maybe put some extra content on each product page, such as a more detailed description? I realise it’s probably not easy to write 2-300 words about a light bulb but it might be worth experimenting on a couple of pages to see if it affects your rankings? Yeh, never had much luck with shop window out of the box. Need the blend of unique content so I wanted to pursue it I’d definitely add a blog to go with it. Where would you recommending getting hold of dropped domain names? I did use some web site a few years back but that has since stopped operating. Free sites would be preferable! For catching domains I’ve had pretty good experiences with namewarden.com, they charge £25 which is one of the cheapest I’ve found so far. David,why do you think that he need to drop the adsense? I don’t think it necessarily makes sites untrustworthy if done right. Great site. Nice reduction in categories, very skillfull. Im still using the old shop window engine at Consumermarket.co.uk check it out tho. would love some SEO tips anyone??? ?